A bright, healthy smile is a lot more than just brushing and flossing every day and visiting Salmon Creek Family Dental for your regularly scheduled check-ups and cleanings. These five simple steps canl help you maintain great oral hygiene as you go about your daily routines. It’s essential to remember that everything you eat has an effect on your teeth. What’s generally bad for your overall health is also bad for your teeth. For example, foods that are high in refined sugar aid the growth of the bacteria that produce plaque. This sticky, yellow substance spreads onto the surfaces of our teeth as well as those hard-to-reach areas, producing cavities, stains and tooth decay. It’s important to not only brush every day – twice a day – but to brush correctly to remove as much plaque as possible from the surfaces of your teeth. Even though you’re brushing regularly, you may not be getting the most out of this daily habit. As Dr. Nelson and your hygienist about the best toothbrush and toothpaste for your needs, and request a short lesson on the best way to brush your teeth at home. is flossing your teeth regularly as important as brushing them? A daily routine of flossing your teeth can have many benefits, even if you’re just starting out. Effectively flossing your teeth removes plaque and bacteria that gathers between teeth. If you’re not sure how to best floss your teeth, ask Dr. Nelson for some simple tips. Regardless of whether or not you’re using smokeless tobacco or smoking cigarettes, you’re at a risk of oral cancer while using tobacco products. In addition, using tobacco products increases the chance of other dental problems, such as gingivitis, periodontitis and tooth decay as well as bad breath and stained teeth. Seek out a cessation program to eliminate these products from your daily life and improve the health of your teeth. The standard recommendation is to visit your dentist office twice a year. This is a great guideline, but you may need more frequent visits depending on your specific situation. Talk with Vancouver family dentist Dr. Nelson regarding issues like swollen gums, discolored teeth, oral cancer screening, frequent cavities, and any previous dental work you’ve had done. 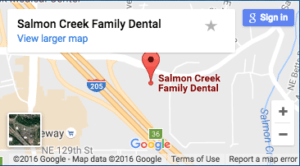 Working together, you and the entire staff at Salmon Creek Family Dental will figure out a schedule that’s right for you.